In the interest of full disclosure to non-longtime readers, I'm an Olympics nut. My parents recorded the 1988 Summer Games' Opening Ceremonies, and I actually hunted down magazine articles about Kristi Yamaguchi when I was seven years old. I set my alarm clock for 3:30am for the 1996 Summer Games to watch early rounds of women's gymnastics. For the London 2012 Games, my husband and I actually rescheduled our lives to match Greenwich Mean Time and stream the events live. And those are only some highlights of my Olympic craziness! So, when I heard about The Gabby Douglas Story, I was intrigued. Gabby was an athlete I followed closely a year and a half ago, though she was not my favorite from Team USA. Still, I had watched her special on Oprah and read some other stories, so I was interested in sitting down to learn more about the athlete. I came away with a lot of questions regarding what I saw, and I was able to ask the young champion about some of the issues that were bothering me. But, first, let's look at some of what is in the movie. - Gabby is born with a rare blood deficiency, and the fourth child in a poor family. After quite a while living in the family van when Dad can't find work, her mother, Natalie, takes the kids to her mother's house for stability. Her father is not mentioned for the rest of the movie. - By the time Gabby is walking, her bloodcount is about normal, and complications from her condition are never mentioned again. - Natalie becomes a great bad-debt collector, buys a house in Virginia Beach, and helps the kids make a vision board of things they want to accomplish. One of the items on there is a dog, and Natalie eventually gives in. - Gabrielle picks up cartwheels and backflips in no time, so Natalie looks into putting her in a real gymnastics class. She’s too good for the basic class, and is soon starting on the apparatus. The kids charge classmates to watch Gabrielle do tricks, but Natalie makes them return the cash. Her sisters then decide to give up their sports so Gabby has the money to go to camp, because they know she has talent. But, her sisters do little else in the rest of the film. - Natalie begins getting terrible migraines and constantly battles getting medication to manage them. She eventually has a bad reaction to the medicine and must stop working so she can rest. However, her condition is never diagnosed on-screen, nor is the current state of her health. - Gabby qualifies for junior elite, which has her traveling frequently, and needing to be homeschooled. But, her homeschooling is never covered. - Gabrielle is upset that she didn’t make the national team, because of her skills on uneven bars. Shawn Johnson did, however, and when the family watches the Olympic trials, Gabrielle decides she wants the same coach as Shawn. And, although she eventually works with him, she's never seen meeting Shawn. - As money gets tighter, Natalie pawns some jewelry, then decides to accept food stamps, something she said she’d never do when she was with Gabrielle was born. It is not shown how long the family depends on them. - When Gabby attends a clinic with Liang Chow, she is able to learn the Amanar vault, with a blind landing. The way the biopic depicts it, Chow works with Gabby all day and not the others in the clinic, which seems odd. - Gabby is desperate to continue learning from Chow in Des Moines, IA, and despite learning that Chow trained away from his family in China, Natalie continues saying Gabby cannot move to Iowa. Gabby quits gymnastics and goes on a hunger strike, but it's her grandmother's support that convinces the family to allow Gabby to move to Iowa for two years, living with a host family while there. There is no background on how the host family (with four young daughters) came to the decision to offer up their home, though Gabby is seen interacting with them and spending Christmas with them. Their current involvement in Gabby's life is left unmentioned. - Gabby arrives in Des Moines 22 months before the London Games, and begins training 28 hours per week. She gains ten pounds of muscle in a matter of months, and picks up routines she couldn’t do before, but suffers a hamstring injury two months before the VISA Nationals, forcing her to work on her upper-body strength. How this factors into her overall training and abilities is not addressed. - Although Gabby quickly notices the lack of black people in Iowa, issues surrounding racism are largely absent. - Her family watches from home as Gabby competes in the Championship, where she messes up on the beam multiple times. The experience makes her want to quit, just 210 days before the Olympics are scheduled to begin. 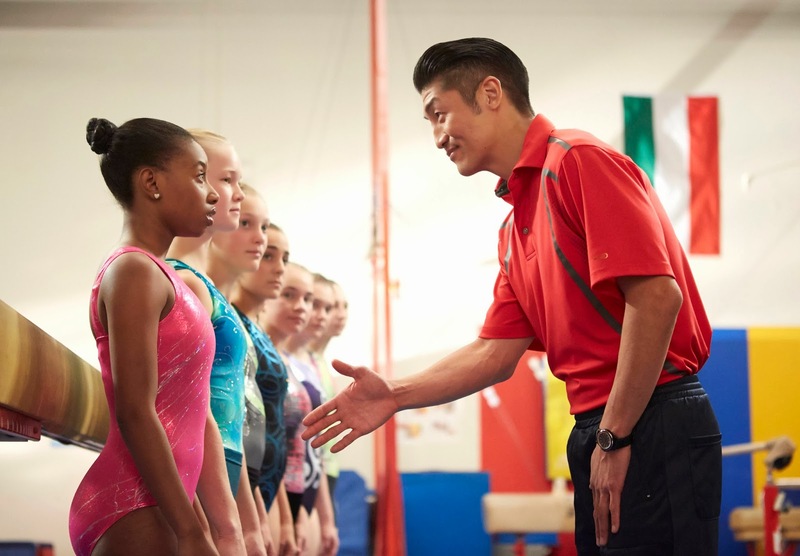 Her mother visits, but Gaby tells her that gymnastics is no longer her passion, but Natalie won’t tell Coach Chow. Gabby decides to be honest with her coach, who tells her that she must have the heart of a champion to continue. It's her brother who reminds her to go for the gold, thanks to the vision board. It's nice to see her family once again influencing her (it seems for a long time she just does what she wants), but let's not forget what year it is - long-distance phone calls are cheap, email is free, and we're under the impression that Gabby rarely talks to her siblings... it's not really plausible and should be fleshed out more. - Pretty much the final part of the story in the movie is Gabby nailing the Amanar vault as an alternate in a New York competition 21 weeks before the London Olympics, and then a quick look at the San Jose Olympic Trials and a glimpse at her winning at the London Games. This, perhaps, made me the angriest; her story doesn't end there. Amy: I wanted to go back to the faith part for just a moment. I know it’s a big part of your life and it’s come up in interviews and articles and things like that elsewhere but I felt that your faith was absent from the majority of the film. Do you see it that way or have any comment on that? Gabrielle: I think in the film or the end of the film - not really. You know, in real life it’s still there but in the movie I think it’s really focused on my life story. I don’t really feel like it’s distant. Amy: What about the bullying issue? In the film we see the actress portraying you explaining that your mom had told you to let her know if anybody had ever said anything and later she asked her mother about her nose. But otherwise you really don’t see any concerns about bullying or any of the issues regarding your hair or other things that you commented on in other interviews. Any thoughts on why the bullying didn’t play a major part in the movie? Gabrielle: Well I explained on it a couple of times in the media and I - or me and my mom and, you know, people that were in the loop with the movie, we just felt like we didn’t want to touch on it again because it’s like the movie’s something more like the challenges and the difficulties and we didn’t want to put the hair issue in there because we really weren’t focused on what people had to say about my hair. It was, you know, the road to London. Amy: Okay, that’s wonderful. And then last question, did you donate any personal items to the film like posters from your bedroom or leotards that we saw the actress wear or any other props? Gabrielle: I don’t know if I donated any personal things. - She's a Patriots fan. - On Regina King playing her mother: "She is amazing. She’s such a doll and she played my mom so well. Me and my sister were joking around, 'Mom she even played a better you.'" - She's looking forward to watching figure skating in the upcoming Winter Olympics. - When she was at her lowest point and wanted to quit, her plan was to work at Chick-Fil-A, because "they have good sandwiches and really good food." - Right now, in her training for 2016 in Rio, she's training 4-6 hours/day, 6 days/week. - To put things in perspective, she used to get mad when she didn’t get to go school shopping. Her mother explained that “not everyone gets to go Italy for a competition,” and she realized that was a good point. She does get to hang at the mall and have sleepovers, though. - Fashion-wise, she likes crop tops with skirts, long skirts with short-sleeved tops, or tank tops or long-sleeved shirts with jeans and combat boots. - She texted and talked on the phone with Imani Hakim, who played her. - Her celebrity crushes include Ian Somerhalder and Dave Franco. 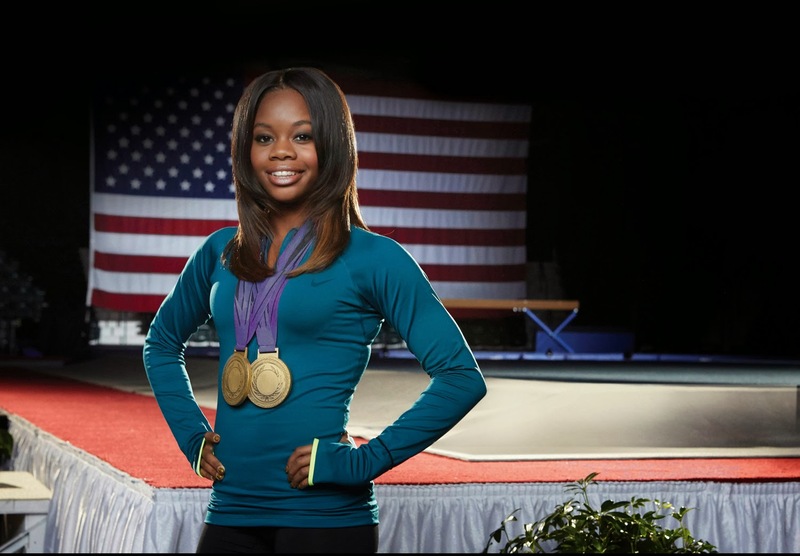 Tune into the premiere of The Gabby Douglas Story on Lifetime tomorrow, Saturday, February 1st, at 8pm ET/PT.